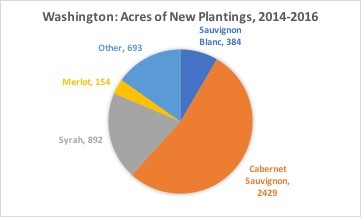 Washington State’s Cabernet Sauvignon plantings have increased dramatically in recent years, driven by consumer demand and the price premium this grape commands. Cabernet Sauvignon plantings have also taken off in California in appellations like Lodi and Paso Robles. So is this huge growth in Washington’s Cabernet Sauvignon sustainable, or is this just another of the wine world’s boom and bust cycles? We look in more detail at Washington Cabernet Sauvignon in this article and, also, in our forthcoming new International Wine Review report Wines of Washington State Revisited. Washington State’s wine grape acreage has increased significantly over the last few years. 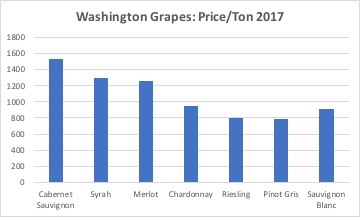 As reported in the 2017 Washington Vineyard Acreage Report, grape acreage in 2017 was 55,445 acres, a 26% increase over 2011. Most of this increase is attributable to the growth in plantings of just one variety, Cabernet Sauvignon, which increased an astounding 81 percent between 2011 and 2017. Cabernet Sauvignon is now 37 percent of all wine grape plantings in Washington State. 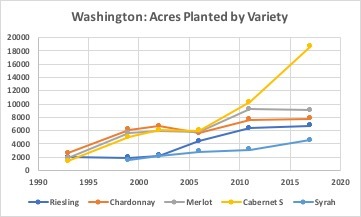 The trend in recent plantings (see the graph below for plantings over the 2014-16 time period) suggest Cabernet Sauvignon will become even more dominant in the future. Washington’s first planting of Cabernet Sauvignon was at Otis Ranch in 1956 and at Harrison Hill Vineyard on Snipes Mountain around 1962. Both locations are relatively warm sites in a cooler area of the central Yakima Valley. These were followed within a few years by plantings at Champoux (née Mercer-1972) in the Horse Heaven Hills, Cold Creek (1972), northeast of Yakima Valley and west of Hanford, Celilo in the Columbia Gorge (1972), at Red Willow in the extreme west of Yakima Valley (1973), and Sagemoor, in a warm but isolated area north of Richland (1972-73). All of these were own-rooted plantings, using UCD Clone 8, a consistent, medium vigor, reliable clonewhich still represents 80% of Washington Cabernet plantings. Today, Cabernet Sauvignon plantings are concentrated in the Horse Heaven Hills and Wahluke Slope appellations within the larger Columbia Valley AVA. Why are Cabernet plantings growing so fast? Growers may not be economists, but they respond to economic incentives, and in Washington State Cabernet Sauvignon enjoys a healthy premium over most other varieties. In 2017 Cabernet Sauvignon grapes sold for $1536/ton on average compared to $1198/ton on average for all grape varieties (see graph). But it’s not just Washington growers who respond to incentives. As we observed in our recent report on The Wines of Lodi the tons crushed of Cabernet Sauvignon increased by 57 thousand tons, or 35 percent, since 2010. In just seven years, Lodi’s increase in production was almost equal to the total production (tons crushed) of Cabernet Sauvignon in Washington State in 2017. And this same phenomenon is being repeated elsewhere in California. 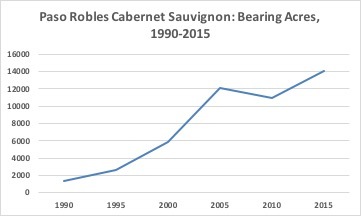 As we noted in our 2017 report on Paso Robles, plantings of Cabernet Sauvignon have increased 143 percent since 2000 in that AVA (see graph above). According to the 2017 California Crop Report, Paso Robles (San Luis Obispo County) now has 14,500 acres of Cabernet Sauvignon, or 70 percent of the total now in Washington State. The boom in Cabernet Sauvignon, in Washington state and elsewhere, is driven by consumer demand, which is reflected in the lofty prices growers receive for their Cabernet grapes. The sharp increase in Cabernet Sauvignon plantings and future increase in tons crushed and wines produced should constrain and possibly reduce wine prices. It’s also possible that consumer demand for Cabernet Sauvignon will continue to grow even faster than production. That would seem unlikely given the overall stagnant state of the wine market, but who knows? 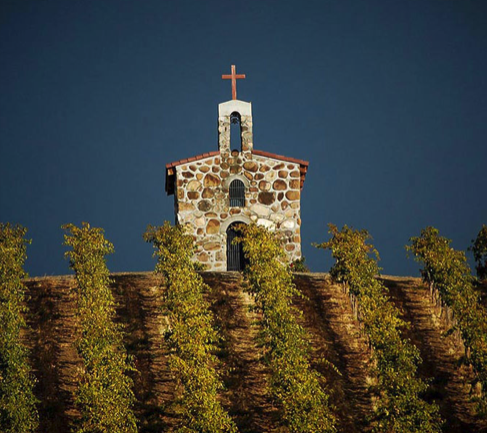 This entry was posted in Cabernet Sauvignon, Countries and Regions, Markets, Red Wine, Uncategorized, Washington, Wine Articles, Wine Type and tagged Economics of Wine, Featured, Lodi, Paso Robles, Washington, wine market. Bookmark the permalink.